Reserve Paws A While Today! My kids and I absolutely loved this cabin. It was clean, comfortable, and came with a fully stocked kitchen, including glass top stove, microwave, dishwasher, blender, toaster, and all the dishes/glassware/cookware you need. There was also a washer/dryer that would’ve come in handy if we’d stayed longer. The hot tub was clean and the hot tub deck included a gas grill. The location was close to the strip but away from the noise. The only thing that would’ve made it more perfect is a better view of the mountains from the cabin but it was nice being close to town. We were sad we only stayed 2 nights and would definitely like to go back! The say was very nice-and would definitely do it again. This is our 2nd time renting with Cabins USA. Great experience both times! Make the checking in and out process simple and convenient! Both properties were very nice and well maintained! Would highly recommend! I would have liked a more of an updated pictures of the property. The pictures show a brand new place and lots of furniture. However that’s not what was in it. The fireplace didn’t really well and there were stains on the couch and chairs to the point I laid a blanket on the couch before I sat down. The bathroom on the second floor had issues that needed to be cleaned before I used it. So they need to work on cleanliness of the cabin and more updated pics. Cabin USA was great other than that. Will stay again at another location though, lol. Loved the location of this cabin. Cabin is spacious but needs updating especially the furniture. Was overall clean but in my opinion floors could’ve been cleaned better. I will definitely rent from CabinsUSA again. Our 3-day stay (recently) was perfect! Everything from arrival to check out, plus in and out of the property was "OVER THE TOP!" We have and will recommend PAWS A WHILE. " Thank you " from the Davis Family from South Texas! We stayed at Paws a while for 3 nights in June. And the cabin was very spacious. We had a group of 8 and the cabin was perfect space for us to have alone time but also set up good to have time together. Everything was as it should be but we did have to call the office to get a new propane tank on the first night. The first level second bedroom toilet didn’t flush (something was wrong with the handle) middle level ceiling fan was broke (not really an inconvenience) and the cabin only left us 2 trash bags for the kitchen which wouldn’t have been a huge issue except we cooked dinner a couple of times so it filled up quickly. I read reviews previously about the refrigerator being “broke” but a lot of fridges need things in them to keep up a temp so by our second night the fridge was cold. Over all we had a great experience and can’t wait to come back! Very nice, great location. Had a couple minor Maintenance issues, called the office but was on hold to long, left message but my call was never returned. All in all great stay.. Perfect cabin for Spring Break! Five mins from the main drag & all the attractions. Our group had four adults & 3 kids & we had more than enough space. The location was great, the home it's self needs some update and more utensils and soap for dishes and the furniture also need a update, but besides all that the place was very nice very local we all had a nice time. Beds are comfortable. We enjoyed our stay at this cabin, I wished it had been checked before before we checked in because the kitchen light was blown or it didn’t work and also it wasn’t as clean as it could have been. I’m not a picky person at all but when we scooted the couch out so we could lay out the bed underneath there was tons of dirt. Overall though we loved this cabin and it’s convenient location. The hot tub was amazing and we loved that all 4 rooms had its own bathroom inside. My last complaint would be that the game room needed more furniture to sit on because there’s only a single couch down there. The cabin was very nice. The only complaint I have is the living room furniture. It was extremely worn and uncomfortable. The beds were very comfortable and the kitchen suited our needs perfectly. Cabin was very good except for one thing...... it sleeps 12 but will only seat 6. Living room only had room for 6 people,why??? Thank you for taking the time to let us know about your recent stay in Paws A While! We here at Cabins USA work hard to make sure each of our guests have the best stay possible while vacationing in the Smokies. I will forward the issue about the seating to the appropriate department. I sincerely apologize for any inconvenience. When you are ready to stay with us again, please mention you are a return guest for an additional discount. Thank you for choosing Cabins USA and we look forward to having you as our guest again! We really enjoyed our stay here. Overall it was clean and comfortable for the price. The hot tub was a nice addition and the kids enjoyed the pool table. Biggest complaint I have was the pool should be kept up better. It wasn't a very nice pool nor very big pool but that would have been ok if it was at least clean enough to swim in. The water was green and the area around the pool was gross. Also I'm quite sure the outside grill at our cabin has never been cleaned. We had to clean it up enough to use it. Which is a big feature when camping. Overall we had a great stay here. Hello the stay was fun. I feel there should be a better trash system so the back doesnt get filled up as much say a pick up every other day would be nice. I always enjoy staying in cabins when ever on vacation. Just like other reviews the furniture needs upgraded pretty bad. The bed rooms were nice and very roomy. I noticed the receptacles in the master bed room and a few others were missing the front covers and we didn'thave enough dishes for 12 people barely for 4 and we for sure needed a broom but did not have one so cleanup was little harder. Also as a chef instead of goin out to eat all the time we cooked and the smoke detectors went off for everything we cooked. Maybe to close but also noticed there is not an exhaust fan to take any heat out. The paws a while cabin for our group of 10 met our needs. The accommodations were sufficiently clean. The furniture (couches, tables and loveseat) showed wear and tear and is probably overdue for replacement. A couple of light switches didn't work and a couple of receptacles were missing covers. The staff was very pleasant and helpful. Overall we enjoyed our stay using Cabin USA facilities and would use them again. Thank you for taking the time to let us know about your recent stay in Paws A While! We here at Cabins USA strive to give each of our guests the best stay possible while vacationing in the Smokies. Thank you for letting us know about the condition of the furniture as well as the light switched and receptacles. Those have been forwarded to our maintenance department to be addressed. When you are ready to stay with us again, please mention you are a return guest for an additional discount. Thank you again for your review and thank you for choosing Cabins USA. We loved this cabin! I would stay here again and I recommend it to families and groups. The location was very easy to find and close to the main road. The cabin was beautiful and very clean. The hot tub was great! Great weekend with great people. Cabin was very clean. More dish rags are needed. Ricky the raccoon got in the outside trash but other than that a great place to stay. We can't control the weather but wish it was colder. I would recommend to friends. Thank you for letting us know about your recent stay in Paws A While! We here at Cabins USA work hard to make sure each of our guests have the same great stay you enjoyed while vacationing in the Smokies. When you are ready to stay with us again, please mention you are a return guest for an additional discount. Thank you again for your review and thank you for choosing Cabins USA! Our initial cabin was the River's Edge, but due to the smell of the inside and outside of the cabin, we had to request for another cabin. Was told that they had laid some type of compost in the area, to me it smelled like something had died. My wife and nephew became sick for a few hours. The Staff said no refunds could me given but could move us to another cabin if they had one (Which this was what we wanted anyway). With our fingers cross, they had this cabin available. The Paws Awhile cabin was okay - since we really had no choice on cabins we would have liked. We planned this vacation a few months back with hopes of having a river view and pit-fire cook outs. The Paws-Awhile cabin was okay, could need some updates. Beds was kinda uncomfortable, lots of steps for people with knee issues, but main concern was that we saw a few roaches on kitchen floor and in bedroom sink on the last two nights stay. We did not call staff cause we really had no other place to go and wanted to try to enjoy what was left of our vacation without worry about trying to get another cabin. Have stayed with Cabins USA before and they do try to work with you and they do have some great cabins, I guess we just booked one at the wrong time and picked the wrong cabin. Just need to ask more questions next time and make sure we pick the right cabin next time. The girl at front desk was nice and polite and did her best to accommodate us. Some one should let your business know ahead of time when they laid compost so issues like this won't happen, this stuff really makes people sick and can't be good. Thank you though for helping us to relocate so we would not have lost our money. I stayed here with 3 other couples and it was very nice that we had 4 bedrooms with each of them having their own bathroom. That was nice and provided a lot of privacy for each one of us. We liked the location, just a short drive to the main attractions. There were several other cabins nearby but it was very private. Parking is adequate for 4 cars. We found the cabin to be clean but a few minor things could be improved on. The grill was filthy, we didn't use it. The electric can opener didnt work and neither did the manual one. The crockpot didn't work, luckily we brought our own. There were no dish towels or pot holders in the kitchen. The ice maker in the fridge didn't work. The jacuzzi in the bedroom on the second floor shot water out through one of its nozzles. We tried to reposition it back down, but everytime we would turn it on, it would spray across the room. Those were all just minor things that didn't affect us much , we just found ways to go around it. But in case, someone is reading this who is going to be staying there, you may want to take your own dish towels, crockpot, can opener and buy some bagged ice. But there is one thing that concerned us and that was the box on the back porch for the trash. We took the trash out everyday and put it in the box provided. We found, one morning, that an animal had chewed up into the trash bags. It smelled really bad on the deck because of that trash bin. I think the trash needs to be somewhere else , away further from the deck and emptied every few days. But our stay in Pigeon Forge was really good. Dealing with Cabins USA has been a good experience. We did the express check-in and check-out. That was nice. Thank you for taking the time to let us know about your recent stay in Paws A While. We here at Cabins USA work hard to make sure each of our guests have the same great stay while vacationing in the Smokies. I apologize for the cleanliness issues you experienced during your stay. Your comments have been forwarded to our housekeeping supervisor to be addressed. Your comments about the location of the trash can has also been forwarded to our Owner Liaisons to see about the possibility of moving it. When you are ready to stay with us again, please mention you are a return guest for an additional discount. Thank you again for your review and thank you for choosing Cabins USA! The overall cabin was nice, the furniture needs some updating because the kitchen and living room tables were stained and scratched up as so was the furniture. Some of the bedding pillows were stained and could have been washed for freshness. There was also cob webbing in some of the rooms along spiders. On the listing it stating that there was a game room which included a pool table and more but it was a pool table and nonthing else. I would say the cabin has spacious bedrooms and is suitable for a large family, however the cleanlines was not the best, When we arrived the floors had not been swept or moped. Our socks that were white quickly became black. The utensils in the cabin could be updated, the spatula that was there to be used was broken and the knives are very dull. We had to go out and buy some items to use to cook with and to be able to cut some veggies. Other than that I would say the stay was great. The second night there the air conditoner messed up and we called maintenance and they came out right away, once they realized they needed a professional air conditoning company they called and one came out right away and stayed there until it was fixed. Staff is very friendly and accomodating. The cabin was in a resort and it was very peaceful and quiet. We always stay with Cabins Usa and will continue to do so. Thank you for taking the time to let us know about your recent stay in Paws A While! We here at Cabins USA work hard to make sure each of our guests have the best stay possible while vacationing in the Smokies. I apologize for the cleanliness issue you experienced during your stay. Your comments have been forwarded to our housekeeping supervisor so they can be addressed. When you are ready to stay with us again, please mention you are a return guest for an additional discount. Thank you for choosing Cabins USA and we look forward to having you as our guest again! There were 4 couples in our group. Plenty of space to be in a group and just enough privacy if we wanted to be alone. We all had a great time and the cabin was just as it is pictured! Our group of 10 (three generations) loved Paws A While. We've vacationed several times in the area and this may have became our go to cabin for our future vists. It was quiet and peaceful, just off the busy strip but not way up the curvy mountain roads. Still had serenity surrounded by the woods and nature with the ease of town just minutes away. The rooms were nice and well stocked with nice linens, a full kitchen and lots of perks. Just a few small things I noticed, and I wouldn't even call them issues or complaints, but recommendations, maybe. 1. The kitchen could use another set of towels and dish cloths. Pot holders also. We made do with what we had, but had nothing to wiped down the counters when it was in the washer. 2. There was no broom. I just grabbed one at the store and left it there for future guests. We had six kids, a broom was a necessity for us. 3. The jacuzzi in the 3rd floor master shot out black stuff from the jets. After reading up on it, we learned it was common and needed some special cleansers and techniques. Not a biggie for us, but housekeeping will definitely want to take care of that. I will recommend Cabins USA and Paws a While to others. We thoroughly enjoyed our stay! I recently stayed at paws a while we had a blast plenty of room we had 10 adults with no problems I will stay again. Thanks Cabins USA great job. I am so happy to hear that everyone enjoyed their stay in Paws A While! When you are ready to stay with us again, please mention you are a return guest for an additional discount. Thank you for choosing Cabins USA and we look forward to having you as our guest again! Had a great girls weekend full of shopping and food. We were very impressed with the spaciousness of the cabin and the location was perfect. Loved the express checkin option. Needed towels and management promptly left us plenty. I would definitely recommend Cabins USA. This cabin was very spacious and clean. We had everything we needed right there when we arrived. We had a group of 12 and the cabin was big enough for everyone to have their own space. We will definitely book this cabin again in the future should we need a large cabin. I am so happy to hear that everyone enjoyed their stay in Paws A While! 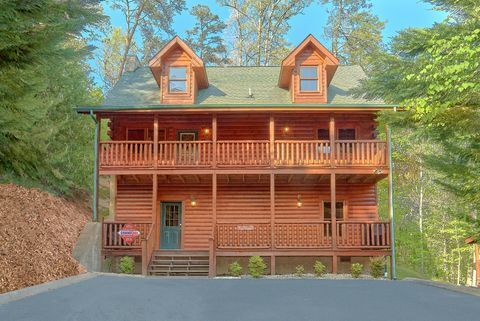 We here at Cabins USA work hard to make sure that each of our guests have the same great experience you enjoyed while vacationing in the Smokies. When you are ready to stay with us again, please let our reservationists know you are a return guest for an additional discount. Thank you again for your review and we look forward to having you as our guest again! My family stayed three nights in this cabin. We had no problems, it was very nice. We will use Cabins USA again. Thank you for choosing Cabins USA when you visit the Gatlinburg and Pigeon Forge area. We appreciate when our guests decide to use us year after year. Please let us know if you would like any help in planning your next trip to the Smokies. Our reservationists are always more than happy to help each of our guest find the perfect cabin. Thank you again for choosing Cabins USA and we look forward to having you as our guest again! I always book with Cabins USA because they always exceed my expectations. The only issue I had was that I was grilling and the grill ran out of propane as I was cooking. This has never happened before. But overall I loved the cabin and the amenities. The staff is always professional and pleasant. I have recommended you all to friends, family, and coworkers! Thank you for always choosing Cabins USA when you visit the Smokies and thank you for all of your recommendations! We feel that is the highest compliment our guest can give and our staff works hard to make sure that each of our guests have the same great experience you do. I apologize for the issue with the grill. I forwarded your review on to our maintenance department so that issue does not happen in the future. Thank you again for choosing Cabins USA and we look forward to having you as our guest again! We enjoyed the cabin and had plenty of room. I've booked your cabins numerous times. My only complaint is the carpet on the steps and the game area was filthy.Would be nicer if it was removed. Thank you. Thank for choosing Cabins USA when you vacation in the Smokies and I am happy to hear that you enjoyed your stay in Paws A While. Thank you for letting us know about the carpet on the steps. Maintenance has been notified and will be taking care of that issue. Thank you for your review and we look forward to having you as our guest again! The staff with Cabins USA were great. The location of the cabin was great. The cabin was clean except for the carpet was dirty and the rug in the living room was dirry and also in bad shape. The kitchen was not well equipped. Whatever you are going to use to cook with you better take it with you. Also we put our trash out in the locked cabinet on the back porch and the next morning it was open and all over the porch to be picked up. Cabin needs a garage desposal in the sink. OMG!! WHERE DO I START? WE-MY FAMILY AND I 6 kids and 4 adults really enjoyed ourselves. We loved every inch of the cabin from the time we got there til it was time to leave! There was so much to do and see and believe me we did lol. Looking forward to coming back soon, oh and no critters!! Yay good deal!! Perfect Location ! This cabin is very convenient to all the sights and amenities . I would stay there again. Serious infestation on Lady Bugs! When we opened the dishwasher there were dirty dishes in it. This cabin was very nice. I would recommend it to anyone. I would stay here again in the future. Thank you for submitting feedback from your recent stay with us. We are so glad that you enjoyed your stay with us. A member of our management team will be contacting you shortly to discuss this further. We do hope that you will staying with us again in the near future. Again, thank you for choosing Cabins USA. The first bad experience in 9yrs. that we have been renting. Unforunately for everyone including the staff of Cabins USA the cabin we had rented was trashed by the previous renter and we had to be moved.We always stay in "Rainbow Ridge",we like the view ,the location and the cabins.I requested perhaps an upgrade in Rainbow Ridge and was told because the rate was different it couldn't be done. (Under normal circumstance understandable) We were moved to "Paws A While" which turned out to be "ok"! Upon arrival there was a lot of frustration when they had moved us to a 4bed/3.5 bath when we had reserved 4 bed.4bath. Quite frankly there was a staff member who was extremely rude and should have been a little more professional. We arrived on a Sunday afternoon and instead of dealing with this individual I requested a name of a manager to whom I could speak with. End of exchange. (There was a young dark haired girl who was extremely apologetic,pleasant who kept going into the back to speak with someone.,we presumed she was new,There was another young woman with light brown or dark blonde longer hair who I believe was the not so pleasant individual who my husband spoke with later on the phone). We had 4 couples 3 from Ohio,us being from Michigan who didn't appreciate her sarcasm when we called back at 5pm to see when we would be able to get into the cabin,adding check in time is 3 pm,which she shot back is not guaranteed. We did get in at approx. 5:40 p.m. only because I made another call to the office to make sure she had my cell number correct. We discovered cabin had not yet been cleaned,but within 10 min. the crew had arrived. We just went to dinner and told them to take their time. I made a phone call on Tues.she was out but I spoke with a manager on Wed. I appreciated the time she took to listen,apologize for the situation and offer to move us. We were not interested in moving at this point. She did make it right by offering a coupon on our next visit. I believe after speaking with this manager had someone at the office called her this situation could have been avoided. Our original choice, Bear Claw, became unavailable due to structural issues. This was subtituted by your staff. It is a nice place but NOT Hadicapped friendly. We had chosen Bear Claw for the limited steps on entry and the fact that you entered on the main level ( Kitchen, LR, BR, Bathm, Deck, and Hot tub) where most of the use would occur. (One of my party -for whom the trip was planned is handicapped) This cabin - while very nice and had the ammenities we sought - was very difficult because of her condition. The Steps to the main level are VERY STEEP and took almost 30 min to get her up the stairs. Needless to say we wound up staying in the cabin FAR more than intended. This was supposed to be a work/shopping trip. The faliure of design of the HVAC system required that we roast on the mid level ( thermostat set at 78) in order to keep the bedrooms and living area on the lowest level warm - due to no unit set to serve the lowest level ( Heat rises not falls - themostat should be on the lowest level). My work was hindered by the fact that the WIFI was not working - apparently somebody switched out modems and never reset the system. I did finnaly get a MYfi brought to the cabin by maintenece mid morning of the day after arrival. With the needed repairs and cleaning of the carpet especially on the stairs this would be an excellent cabin. I loved this cabin, I never wanted to leave!!! The pictured dont do justice!!! I will continue to us deer path cabin in the future!! Five of us girls took a trip to celebrate the 40th birthday of one of our friends. Paws a While was a great selection! The staff at Cabins USA was very helpful when we checked in. The cabin was located just a couple of miles off of the main strip in Pigeon Forge. We had trouble with the key coded lock when we arrived, but Cabins USA promptly sent a very nice looking maintenance man out to help us out...lol. The cabin was beautiful! We had plenty of room! It was very clean and comfortable! We cooked breakfast each morning and the kitchen was well equipped. Bathrooms were spacious and clean. Plenty of hot water when showering. There are about 6 or 7 cabins right there together and most of them appeared to be occupied, but we felt safe and did not have anyone to bother us. I will point out that there is little privacy to noise...you can hear noises from floor to floor. No big deal for us, but I guess you would expect that anywhere. We would recommend this cabin...it was great! Hope to go back again soon! The cabin was very nice, when we finally made it there. When we got there to check-in the person at the front desk gave us the wrong directions, so we ended up going out of the way. Traveling all the way from GA, being tired, and ready to get to the cabin, we were very frustrated. We called and complained and were told that we should have just followed the sheet we were given, but not being familiar with the area, we listened to the person who checked us in, and she told us to go in th opposite direction. We ended up having a great time, and we will be vacationing there again!